Wine cork coasters by Vancouver Island crafter - Put a Cork In It. 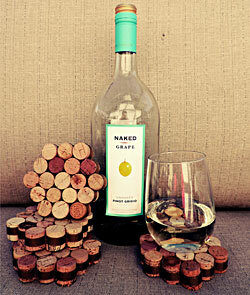 Vancouver Island crafter, Raelene Rozander, is making these great coasters from our recycled wine corks. Raelene grew up in the Okanagan, so has a natural affinity to all things wine and it shows in her work. She has just launched an Etsy page, so take a look and see what she’s up to. Or check out her Creative Corkworks facebook page. Looks to me like a slightly larger of these would be perfect for trivets. Do I hear product line expansion? !